HoA-REC&N’s Youth Negotiation Convention on Climate Change (YNCCC) took part in the Ninth United Nations Economic and Social Council (ECOSOC) youth forum to discuss, “The role of youth in poverty eradication and promoting prosperity in a changing world.” Mr. Nahom Zeleke, Coordinator of YNCCC, was among the participants. 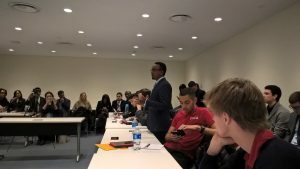 The forum, which took place at the United Nations Headquarters, New York, USA from 29th January to 2nd February 2017, aimed to develop a statement for the ECOSOC high-level segment that will convene in July 2017. At the forum, Mr. Nahom Zeleke voiced concern about the need for more youth engagement in sustainable development implementation processes in Africa. In a speech, he highlighted the need to focus on innovation and entrepreneurship to face the present global development challenges, like climate change. The YNCCC, which is hosted by HoA-REC&N links the youth with on-going climate responses. Currently, the initiative is working on solution-based training thatwill build the capacity of young people in climate entrepreneurship, information service and negotiation, and sustainable development diplomacy.